Sugar Glider would be a classic fruity slot machine if Endorphina didn’t decide to introduce a flying mouse ninja watching over the Zen garden and praying mantis to protect the realm from evil. This is quite an interesting premise spread around 5 reels, 3 rows and 10 adjustable paylines where you’ll be also chasing for Expanding Wilds or try to boost the bankroll through the Risk Game. Join the brave furry warrior, but first, take a few moments to read the Sugar Glider slot review and arm with winning tips. Tired of reading? 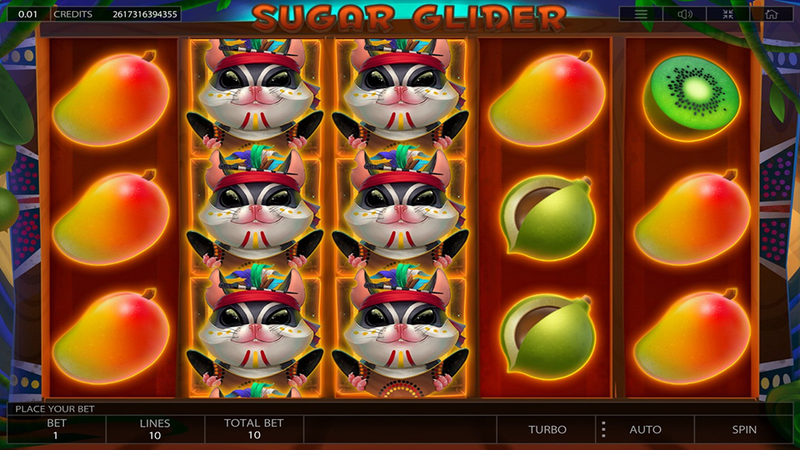 See the Sugar Glider screenshots below and then claim one of the bonus offers of our recommended casinos to play for free or real! What comes first is the answer to a simple question – will you play for fun or for real money? From our experience, newbies often decide to start with the Sugar Glider Free Play since it comes with more than enough demo credits. If that’s your choice too, remember that you can use them to learn how to win and make no additional investment. The game offers a wide variety of betting combinations, so each player would be able to employ his own strategy. With the coin denomination between €0.01 and €1, you can actually wager from €0.01 up to €100 per round by placing 1-10 coins. Depending on your balance, use the Autoplay mode to spin the reels up to 1000x without any interruption. Interesting, left-handed players can adjust the game and see the layout arranged to suit their preferences. Naturally, the paytable is jam-packed with familiar fruit symbols, but this time you’ll get to enjoy those with the Asian background. Passion Fruit and Star Fruit have a bit higher payout rating than all other icons, so you’ll receive 100, 600 or 5000 coins for combination of 3, 4 or 5 of a kind, respectively. You can use Wilds to replace all other icons and score a big win at the same time. Also note that Wilds have nothing with the Sugar Glider Free Spins, which are clearly missing from this interesting game. Instead, they will turn into Expanding Wilds covering the neighboring reel to help you form more winning combinations. Collect 3, 4 or 5 Furry Ninja symbols to claim the Sugar Glider Bonus prize of 200, 1000 or 10000 coins, respectively. After each winning round, lucky winners will have even more chances to boost their bankroll thanks to the rewarding Risk Game. Basically, this is a classic pick-me round where you have to beat the dealer’s hand by choosing 1 out of 4 face-down cards. 3. What is the RTP factor of Sugar Glider? The RTP official info is yet to be disclosed by the publisher, so we will update the Sugar Glider recension accordingly. This is a blast from the past dressed in a modern suite and virtually flooded with coins. Like all other Asian-themed releases, it pays every now and then, so you should definitely stick to the Sugar Glider tips received here.